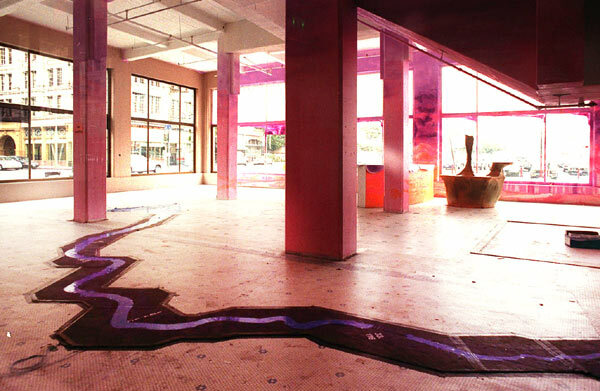 This project was installed during a five-hour art gallery exhibit hosted by the Downtown Artist's Development Associated (DADA) in Los Angeles. The project was an exploration of the Los Angeles river and its relationship to the city. It was installed in the bar area of the gallery (see photos), so there was lots of traffic interacting with the piece. The installationconsisted of a map of the river spread across most of the room, a large projection TV with stereo sound, another television installed in a fish tank (see diagram below). Pressure sensative switches were installed on the toilet handles in the adjacent restrooms and under the map. Over the course of the five-hour party a century of history was presented. Iin the first hour 1900-1920 was depicted, in the second hour 1920-1940 and so on. Imagry on the screen included animations showing water lever in the river (it dropped as more people entered the room, placing demands on the resource; the level increased when a toilet was flushed, adding waste to the system). At random times the river "flooded". A second layer of imagry and sound design was triggered by the location and density of people relative to the geographic areas of the map. If a group of people congregated near the "harbor", sound and images of the harbor were displayed. The piece was entirely dynamic and engagingly unpredicable, as a variety of input factors drove the sounds and images on the screens. 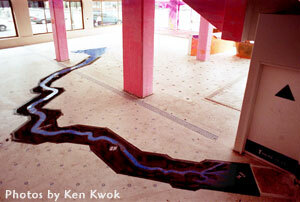 The project was also installed at USC's Annenberg Center for Communications "Interactive Frictions" 1999 conference.